Successfully Added TV Box H96 MAX - 4GB RAM, Wi-Fi, Android 7.1, Quad-Core 64Bit CPU, KODI 18.0, Bluetooth 4.0, 32GB Memory to your Shopping Cart. Runs on Android 7.1enabling it to get access to the latest apps and games. 4 GB of RAM makes it superfast allowing you to multitask without any lag. The display resolution is 4K x 2K, providing you clearer and sharper picture. A TV box is a wonderful invention that allows you to transform your TV into a smart TV. 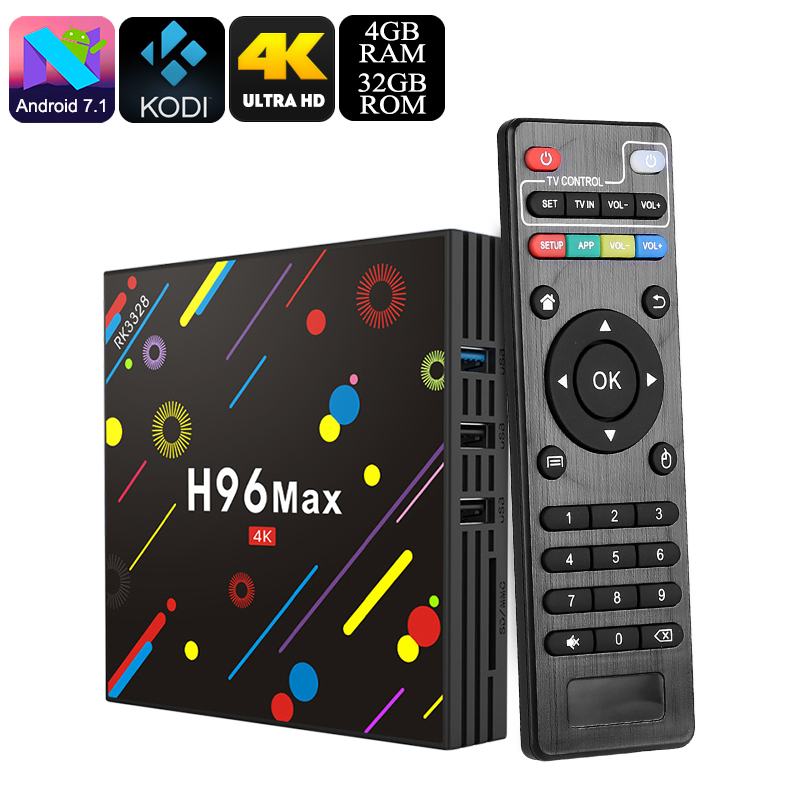 The H96 MAX TV Box is packed with extensive features making it perfect for your entertainment. It runs on Android 7.1 that means you can get both new and old apps easily. Now, you can enjoy the best games and shows with your family. This TV Box has an RK3328 Quad-Core 64bit Cortex-A53 CPU running alongside 4GB of RAM. The processor speed of this box is 1.5 GHz. All this means you can multitask and play unlimited games and enjoy it all without worrying about lag or dropped frames. This makes the system extremely fast and perfect for everything from gaming to a home office. The display resolution of the H96 MAX TV Box is 4K x 2K, so it delivers a better and clearer picture. Now, you can enjoy your favorite games, shows, and movies on a large screen and take advantage of the highest resolutions if you have a 4K TV or monitor. The internal memory of the Box is 32 GB and can extend by an extra 32 GB. This provides you ample of space for storing videos, pictures, and songs. The media format it supports are MP3, AAC, OGG, WMV, ASF, AVI, HD JPEG, PNG, GIF and much more. The TV Box has Wi-Fi support that allows you to watch your favorite shows on Netflix and YouTube without needing to mess about with betwork cables so your free to use it anywhere in the home. You don’t have to use your phone or laptop to chat with your friends and family as you can use all the social netroking apps on this little devcies and even add a camera and mic via the USB ports. So with the help of this TV Box, you can chat with your friends using Skype. You can check notifications and updates on Facebook and watch unlimited online movies. This is a complete package of entertainment and fun for the whole family. The H96 Max TV Box supports Miracast and Airplay, you can easily see the pictures and videos from your smatphone or tablet device on the TV. It allows has KODI 18.0 that will make it easier to find and manage your media needs. This H96 Max TV Box comes with a 12 months warranty. Brought to you by the leader in electronic devices as well as wholesale Android TV Boxes and Dongles..